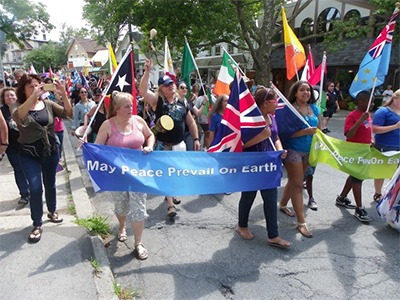 The 5th Annual Woodstock Walk for Peace was celebrated on August 4th. This year the Walk was especially potent with the participation of the Unity Riders who led the Walk through the town of Woodstock. 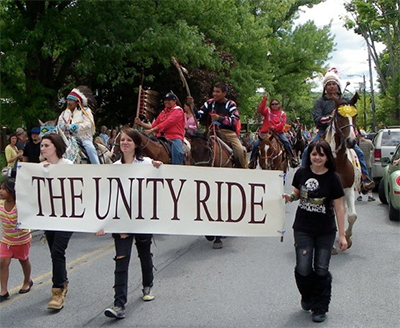 The Unity Riders of Dakota decent started their journey in Manitoba, Canada. After Woodstock they will make their way to the United Nations and on to their destination in Washington D.C. It is a ride for the healing of all nations and for all living things especially for the environment. Participants of the March were led by the Riders and stopped briefly at the Village Green where Senator Cecelia from the 46 district welcomed the Riders. 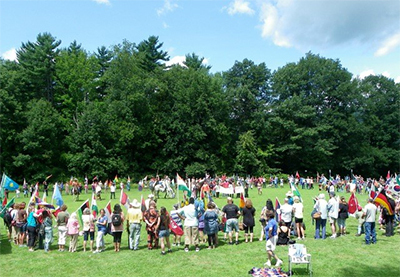 From there the procession made their way up to Comeau Field with the marchers waving the flags of all nations. The program up in Comeau Field started with the honoring of the Indigenous Nations led by Grandmother SilverStar. The World Peace Flag Ceremony followed with all participants creating a large circle around the Unity Riders at the nucleus. 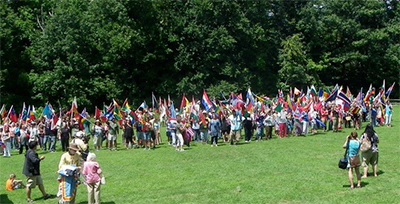 Peace was invoked in each of the 193 countries as the flag bearers walked up to surround the Riders. The final call for May Peace Prevail On Earth was repeated out loud with the flags of all nations coming together as one global family. The 5th Annual Woodstock Walk for Peace ended on a very high note filled with gratitude as we sent the Unity Riders off on the next leg of their journey to the UN and Washington D.C. with blessings from our prayers for peace.